When Oculus announced its PC requirements last week, it underlined something important: virtual reality has an achilles heel. If you want to experience the Rift come launch day, the demands are going to be very high. The HTC Vive will probably be a similar story - as will most serious VR, we're not talking about your mobile malarky - which means early adoption will be reserved for the enthusiasts. That will change over time as the minimum requirements become more affordable, but for the time being cost is going to be a barrier to wider adoption. The other barrier to wider adoption right now is the quality of the technology. VR is impressive but it has to improve; right now there are too many bugs and imperfections. It's something that both AMD and Nvidia are working on, as both parties will be supporting and improving VR technology from now into the future. Back in March AMD announced its LiquidVR development kit, built to optimise hardware and ensure VR developers are getting the best possible performance across devices. The end goal is to create a greater sense of presence for the user - that includes lower latency, higher framerates, better compatibility and comfort, and the ability to dedicate one GPU per eye. It also means basic things like plugging in the Rift and having it recognised as a VR device and not another monitor (anyone who's used the first Oculus development kits will be particularly grateful for this). Most importantly, it's about making this experience universal across the range of headsets, which will transform VR from a techy hobby to a mainstream, plug-and-play normality. "It's a challenge we can help solve," Sasa Marinkovic, Head of Software Marketing, Computing and Graphics Business at AMD, tells TechRadar. He confirms that AMD has no intention to build its own headset any time soon, but that's ok; headsets will arrive in their droves, but a robust software framework that works for as many people as possible is vital for wide adoption. That includes preventing the stuff that makes us feel like we're going to puke. "If you don't have a constant framerate, when you start dropping the frames the whole world starts stuttering," says Marinkovic. "From our side we want to make sure we're doing the best possible thing to clean up the image in the best possible way." AMD will be targeting its own architecture, while Nvidia is also offering performance-boosting VR technology of its own flavour. The Rift will be in consumers' hands in a little under a year but there's a lot of work to be done to ensure that VR is a silky smooth, glitch-free experience. "How do we push as many pixels as possible?" says Marinkovic. "How do we make sure we're pushing teraflops of data out so the user feels fully immersed in the content?" 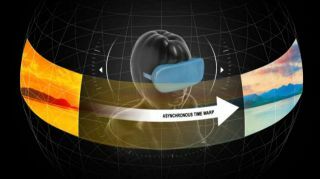 "We have some short term things to get to the long term game, and one of those short term things is most obvious the latency, the duration between moving your head and having your head tracking on the screen. When it's more than 10 milliseconds it's too long." "The minimum performance requirements required for the best VR experience will vary between the different HMD platforms and the content," says Marinkovic when we pressed him on the possibility of Liquid optimising VR for lower-spec rigs. "Our goal is to eventually expand the support for LiquidVR to a wide-variety of GCN (Graphics Core Next) products." We also need compelling content. Sony has just announced that it's set up a studio dedicated to games for its Project Morpheus, and it, like Oculus, will go well beyond games. "We need to enhance the software ecosystem," says Marinkovic. "We are not only talking about gaming - it's the most prominent one - but there are so many more areas that are going to be amazing. So you think about travel or real estate, you don't have to travel there to see what the view from the apartment looks like, or flight simulation… all these areas that are going to be significantly changing. It needs to be both the headsets and the hardware behind it, but also the software. When you are creating something out of nothing you are trying to anticipate how users are going to use it." If VR is going to reach beyond gaming and into other areas - and it will - then it needs to be accessible. AMD has already been working with Oculus VR and Valve on LiquidVR, the latter of which recently announced a partnership with HTC that will bring a headset, the Vive, to the market by the end of the year. Marinkovic sort of sees Valve as a competitor to Oculus, but doesn't think that consumers will have to choose one side when all the players come to market. "I think [Valve] are building their own path here. I don't think there is right or wrong, I think people will be deciding for themselves which they want to experience. I can see people having both, like PlayStation 4 and Xbox One. One of Vive's unique features is its controls, but when it comes to VR input, there's work to be done. "Everyone else is fighting about it, and there's a lot of solutions out there, so we need to pick the best one," Yuka Kojima, CEO of eye-tracking headset Fove, recently told TechRadar. Marinkovic says AMD is "looking at other areas like sensory integration" itself. Until then, the priority is making sure VR is visually perfected come time consumers are able to go out and buy a fully-fledged virtual reality experience for themselves. "We want to make sure we're doing the best possible thing to clean up the image in the best possible way."